I have been in the fitness business for what feels like most of my life. I willingly followed behind my mother during her first experience at the local gym as she struggled to lose weight and get in shape. I now own a fitness studio and see first hand how for her, like for so many people I meet daily, the first few weeks of trying something new is exciting and full of motivation, but then something changes. What exactly that change is and why it occurs is uniquely individual but the result is the same, a feeling of failure. When I probe, the conversation turns towards past failures, disappointment in themselves and the fear of failing–yet again. Fear. We learn it from our parents, from our own experiences and from the world around us. Some of our fears have significant value; yet others can actually limit our lives. Fear is full of powerful energy, and like guilt and shame can overwhelm, overpower and cause paralysis. Even at a very young age, I remember being fearful of meeting new people, of going to new places and struggling to fit in with the kids at school, too afraid to participate in sports and social events. I look back with regret. I missed out on so many experiences and opportunities. Not that it’s gone away. I still live my live with fearful thoughts and I still struggle with feelings of inadequacy, but now I use it as a tool to participate in life, not hide from it, seek motivation from it and not cower to it. Of course, there are many days I still run to my bedroom, shut the door and pull the blankets over my head. But this indulgence comes with a self-imposed rule: I allow myself five minutes tucked away from the world. Not 10 or 7, just 5 minutes. Then I pull myself up and move forward because a life full of fear and regret is no life at all. Facing fear takes courage… and a lot of it. Probably much more than you ever thought you could find. Courage is like a muscle; it gets stronger the more you use it and the more weight you add to it. In my fitness studio, I work with clients building and strengthening the muscles of the back, chest, arms and legs. We begin with light weights and simple exercises. Over time something amazing happens, both inside and out. The weights we use get heavier, the exercises become more complex, the workouts become more difficult and the ability to endure increases. Failure becomes an increasingly smaller fear and success becomes a closer goal. Facing fear and the possibility of yet another failure takes faith. I often use the example of a mirror to demonstrate faith to my clients as we begin our training sessions. 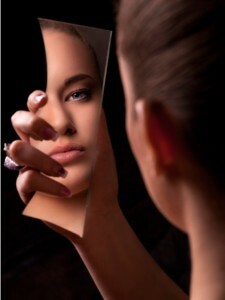 The mirror only tells you how you see yourself in the present moment, it cannot tell the past or the future. The past is in the past but the future is full of possibilities. These possibilities are within you today and that is exciting. So go ahead and strengthen your courage muscle. Begin your personal fitness journey by finding an environment and surrounding yourself with professionals and participants that provide consistent support through each stage of your journey. We are all just traveling the rocky road of life with fear, courage and faith; but together we can make it.